When North Korean leader Kim Jong Un offered to send a delegation to the Winter Olympics in South Korea in his New Year's speech, many North Korea watchers wondered what might have motivated the young leader to make the move that echoed his father’s basketball diplomacy more than 20 years ago. Regardless of Kim's motivation behind the diplomatic initiative, Kim appears to have succeeded in creating a rare feeling of rapprochement between two Koreas that technically remain at war. For the first time, the two Koreas fielded a combined team---women’s ice hockey. The two sides quickly learned to use the Olympics to achieve "a show of unity across the divided Korean Peninsula," the New York Times reported. The North's decision to participate in the Olympics came amid increasing international sanctions, which called for Seoul to engage in a flurry of diplomatic maneuvers to seek a temporary lifting of sanctions against Pyongyang, raising concern in Washington that Seoul was playing into the North's ploy to use the Olympics to ease sanctions. "What this means is it’s so both incremental and drastic, but South Korea is paving the way, bit-by-bit, in setting precedents and creating new norms," said Sung-Yoon Lee, a professor of Korean studies at Tufts University’s Fletcher School of Law and Diplomacy. Former U.S. officials and analysts who deal with North Korea extensively say, however, what Kim has in mind might be much bigger than winning the hearts and minds of South Koreans or flouting sanctions. Kim made a dramatic overture toward Seoul by dispatching his only sister, Kim Yo Jong, to the Olympics to invite South Korean President Moon Jae-in to Pyongyang. With soft diplomacy executed through sports and his sister, Kim is trying to pull off a diplomatic victory in a nuclear standoff with the United States, according to experts. "Sophisticated is not the first word that comes to mind when one thinks of North Korea. But North Korea is very sophisticated in both its PR propaganda campaign as well as provocations," Lee said. "Kim Jong Un didn’t just wake up on New Year’s Day and decide to be a nice man. Obviously, [his] outreach as of early January was premeditated," the professor added. John Park, director of the Korea Working Group at Harvard Kennedy School’s Belfer Center for Science and International Affairs, said there is concern in Washington that Pyongyang’s peace overture will be short-lived. "A strong U.S. concern is that Kim Jong Un will cannily use the prestige of the Olympics to sanitize North Korea’s image as a nuclear pariah state and quickly return to building out a nuclear arsenal," Park said. Kim's invitation could complicate the Trump administration's efforts to pressure the North to abandon its nuclear weapons program, Robert Manning, senior fellow at the Atlantic Council, warned. "The invitation is a very clever move by Kim Jong Un to drive a big wedge [between Washington and Seoul]. Kim has been masterful at public relations in regard to the summit and playing on feelings for Korean unity," said Manning. North Korean basketball player Ri Myoung-Hun arriving at Ottawa International Airport in May 1997. The history of North Korea's sports diplomacy dates back more than two decades, when Kim's father, Kim Jong Il, was in power. The elder Kim ruled the reclusive communist state for eighteen years until his sudden death in late 2011. In early 1997, under Kim Jong Il’s order the North Korean mission to the United Nations in New York made a failed attempt to get a North Korean basketball player to play in the National Basketball Association (NBA), an American professional basketball league. The move came as tensions were rising between Washington and Pyongyang over the North’s nuclear and missile programs. At the same time, the North was desperately trying to survive its worst food shortage crisis. 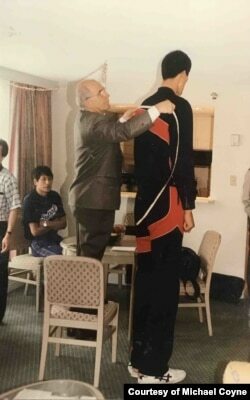 Ri Myoung-Hun, a 7-foot-9-inch 280-pound North Korean, was at one time known to be the world’s tallest active player. In what appeared to be a diplomatic adventure, the late Kim saw an opportunity to promote his country’s image and improve ties with Washington, said Michael Coyne, a lawyer and sports agent who designed the effort. "Kim Jong Il followed the NBA closely and likely understood its popularity. In terms of a PR vehicle, the NBA was [for Kim], and is, perfect, as it is tied so closely with popular culture as well as sports," Coyne said in an email exchange with VOA’s Korean Service. The North Korean mission teamed up with Evergreen Partners, a Cleveland-based sports management firm, and made serious efforts to attract the interest of several NBA teams and some U.S. lawmakers. North Korean basketball player Ri Myoung-Hun is cheered by the crowd in South Korea in Sept. 2002 at the 14th Asian Games. "We believe that allowing Mr. Ri to play basketball in the United States will have a positive impact on relations between our nations by showcasing the benefits of a free and open society to a North Korean hero" said U.S. senators, Barbara Boxer, a California Democrat, and Connie Mack, a Florida Republican, in a letter sent to then U.S. Secretary of State Madeleine Albright and Secretary of the Treasury Robert Rubin in July, 1998. Chuck Daly, then head coach of the Orlando Magic wrote a letter to Coyne, saying: "It is my impression that they feel very strongly that he can play in the NBA," the famed coach said, referring to his discussion with the team’s scouts. "His size and skills indicate that he could have a long career in this league." North Korean basketball player Ri Myoung-Hun competes at the 14th Asian Games in Busan, South Korea in Sept. 2002. The North Korean mission insisted that Washington allow Ri to play in the NBA as a "goodwill gesture" toward Pyongyang, according to Coyne. Washington rejected the North Korean demand, citing U.S. sanctions against the North prohibiting trade with the communist country. Despite the sanctions, Coyne still believes Ri should have been given a chance to play in the NBA, telling VOA, "I lament the fact that a person born with such extraordinary gifts was not able to fulfill his potential due to forces beyond his control."